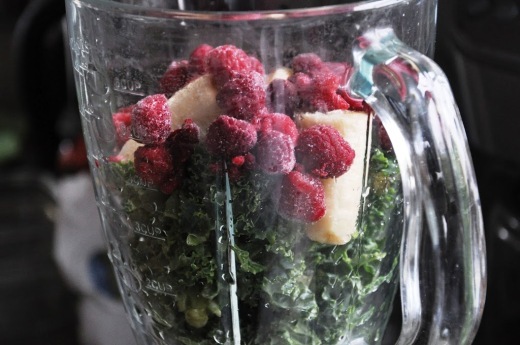 Don’t be turned off by the somewhat…dull color of this smoothie. 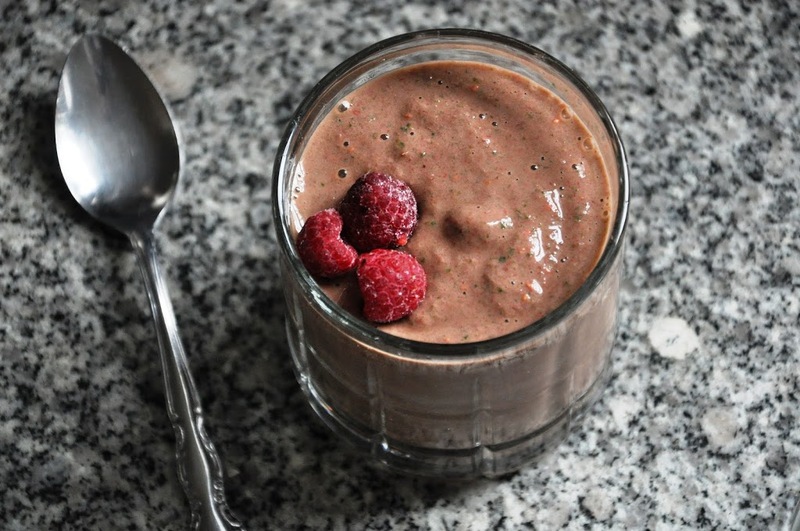 It may not be bright orange or red like the smoothies at the mall, but what it lacks in color it makes up in creamy flavor and superior nutrition. It’s just what the doctor ordered. Literally; I got my tonsils taken out last week and while I can finally choke down real food, smoothies like this are what have sustained me for the last 11 days (along with a certain best friend who created a color coded medication timesheet and woke me up every four hours to ensure I was getting what I needed). What I thought would be a totally quick and easy little procedure turned out to be a painfully slow and tortuous recovery. I won’t go into the gory details, but I can guarantee you it wasn’t pretty. Kinda like this smoothie. It may sound a little whacky, but putting greens in smoothies is a great way to get a serving of vegetables at breakfast, a time when (let’s be real here) it can be difficult to do. The bright and acidic berries outshine any vegetal flavors that you might get from the kale, and the creamy banana and rich coconut milk make for a smooth and luxurious tasting drink that will carry you through the morning. 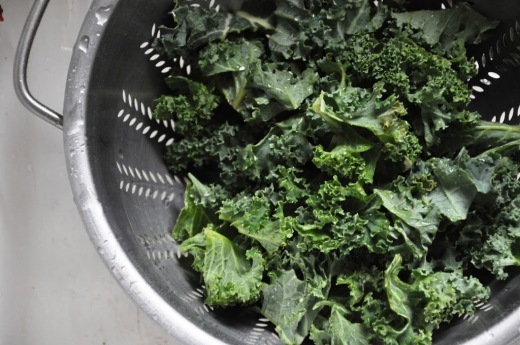 · Kale is high in vitamins K and A (which are fat-soluble, so the fat from the coconut milk in the smoothie will naturally help your body absorb them better), and C. It’s high in fiber and low in calories. YAY! · The short and sweet: berries are high in vitamins A and C, antioxidants and fiber. And they taste delicious. · Coconut milk is rich in medium chain fatty acids, and although current research has presented conflicting views about the health benefits of coconut milk, it has been enjoyed by traditional cultures around the world for thousands of years, something that leads me to believe a little coconut milk every now and then is just fine. Other lovely additions/substitutions would be: plain yogurt, juice, applesauce, mangoes, pineapple, spinach, beets, strawberries, and/or flax oil. Get crazy! Dump and blend. Place all ingredients in a blender and puree until completely smooth, adding water or milk to thin the smoothie to your desired consistency. Garnish with a few extra berries if you like and serve immediately. 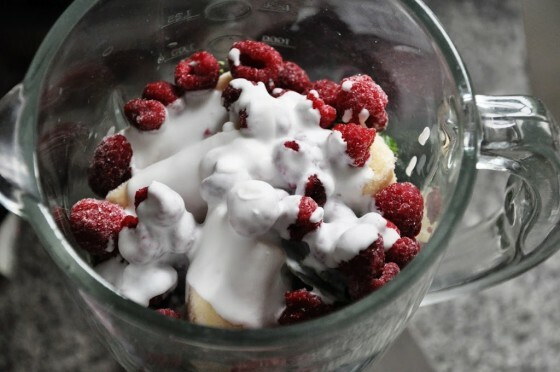 Yeah, it isn’t the prettiest smoothie, but that’s not the point! The flavor is worth seeking out.